The New Canaan fifth-grade Black team poses with its trophy after winning the Milford Tip-Off Tournament. 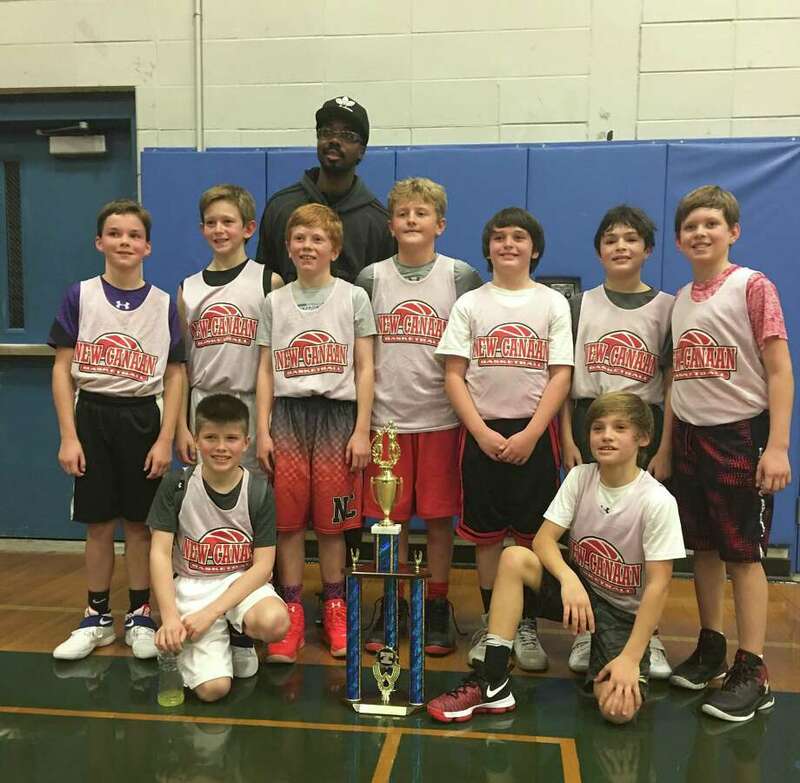 The New Canaan fifth grade NCBA boys basketball Black team edged out 17 teams from across the state to win the Seventh Annual Milford Knights Pre-season Tip-Off Basketball Tournament on Nov. 20. The boys were undefeated, winning all six games over the course of two weekends to claim the championship. The action started on Saturday, Nov. 12 against a tenacious Mashantucket team. The score was tied at 32 in the fourth quarter before the New Canaan boys went on a 16-2 run to win the game 48-34. It was a solid team effort all around. Teddy Whittaker led the team with 21 points. Point guard Griffin Bramwit tossed in 11, while forward Jack Jensen notched seven points to secure the victory. The next game on Nov. 13th had New Canaan matching up against the Trumbull Blue team. The issue was never in doubt with the NC boys pulling away early and winning easily by a score of 40 - 26. The tournament continued this past weekend with a slate of four games in two days. The NC team jumped off to a 28-6 lead against Milford in last Saturday's first game and closed the deal easily with a final score of 51-15. Griffin Bramwit led the team with 18 points. Teddy Whittaker had eigh points and Jack Jensen had six. Luke Bryant, Christofer Ippolito and Felipe Galavis each had four points while Will Langford had three and Ben Michels and Fletcher Heron garnered two points each. Next up on Saturday was the Trumbull Gold team. New Canaan jumped out to 24-9 lead, then pulled away, finishing with a final score of 38-21. Griffin Bramwit and Teddy Whittaker had 11 points each to lead the team. Christofer Ippolito had seven points, including one 3-pointer. The tournament was completed on Sunday, Nov. 20. The semi-final game was against a gritty Milford squad who leaped out to a 12-5 lead. The NC boys soon found their footing and finished out the first quarter down 12-11. The second half was all New Canaan with the boys taking off on an 18-4 run in the third quarter. The final score was 44-26 in favor of New Canaan. Griffin Bramwit led the team with 15 points, followed by Teddy Whittaker who had 13 points. Christofer Ippolito scored 10 points and Ben Michels had six. The championship game took place Sunday afternoon and was a rematch against Mashantucket. New Canaan was down early, trailing by the score of 6-4 in the first quarter before surging out to a 24-12 lead. New Canaan pulled away in the second half, steadily increasing its lead. Teddy Whitaker led the scoring for NC with 21 points. Cooper Smith and Ben Michels controlled the offensive and defensive paint, pulling down rebound after rebound down the stretch. Christofer Ippolito caught fire in the fourth quarter, scoring 11 of his 13 points, including two back-breaking 3-pointers in the last few minutes to ice the game. When the dust settled, New Canaan was victorious, winning by the score of 50-35. "I'm proud of the kids and the parents should be too. They played together and they played well," coach John Winchester said. "It was a great way to start the season." The NCBA fifth grade basketball Black team starts off their regular season on Dec. 3rd against New Haven.